The filed patent can be found here. A MAGNETIC FIELD MODEL THAT ENABLES UNITY BREACH AND THE LOGIC THAT PROMOTED UNCONVENTIONAL INSIGHTS INTO THE DELIVERY OF ELECTRIC ENERGY. It has been a decade now, since I have developed the model described herein and I have decided to ‘go public’ because the issue is of some considerable importance. My claim is that it is possible to breach unity. Needless to say the claim was roundly and soundly denied by our academia. To my shame, until now, I really didn’t fight back, so to speak. I was both disheartened and embarrassed by the academic reception to these unique experimental results. And to advance the technology I needed their sanction. Eventually I was made to feel that I had no right to expound on a subject for which I have had no formal training. Also, I ran out of money and needed to make a living. But times have changed. I grow ever older. And I am determined to ‘get a hearing’ for this matter before I die and before this momentous discovery dies with me. Here’s the thing. Put a load in series with a battery and a switching device in series with the load. Then put a transformer in series with the switching device and finally take a feedback diode from the junction of the transformer and the load and put this back to the battery. It’s a really simple circuit. Great find, and fascinating theory. But regarding the actual device, i am not understanding something.. Was one ever actually built? Or did she only Patent the circuit design (..just to get it into the public domain eventually when it expires as she said). On her blog she says she will not discuss the device, only the theory. And it was fun to see the word "chopper" again in regards to electronics, lol. 28 years ago when i first was employed in electronics, some of the stuff that was already 15 years old then, that we still worked on, had choppers in them. As i recall choppers are not easy to get anymore. A couple years ago i was consulted for help re-building one of these 45 year-old "Brush Mark Two" oscillographic 8-channel chart recorders that NASA used to record telemetry from the Mercury and Gemini launches (lol a 200 pound ink-slinging monster, but state of the art in the early 60's).. We could still get the tubes used in them but not the choppers... And so we had to "cheat" to get it running again (...by substituting the "next generation", but still 35 year-old, design using first-generation discrete transistors.. Which were bad enough since their Beta's had to be matched by hand lol). Well, it works. I made the same experiences with it too, when you loop back into the Coil, and interrupt it. You can gain more Energy that Way. and the Bedini is pretty close to it too. You only need to compare the Parts, and where they are put in. So its actually nothing new, but its like allways the Shame, that the Academics just ignore it and it gets supressed, when they cant calculate it. Or Someone comes, to get a Dr Title when he discover something, what is allready known, and to call the Effect after hisself. Like Corolis, what is plain simple Magnetism from Gravity at last. Isnt that just simple Boast. but i could control it with a Diode mostly, when i did turn it into the other Direction..
Last edited by Joit; 03-25-2009 at 09:34 PM. If positive feedback possible at all then everything is possible, and we know for sure ,that's the truth. Put a load in series with a battery and a switching device in series with the load. Then put a transformer in series with the switching device and finally take a feedback diode from the junction of the transformer and the load and put this back to the battery. But then she talks about the diode running from the junction between transformer and load. I thought the transformer is in series with the switching device. Does this mean the transformer is in parallel with the load? Sorry, maybe I need a picture. Sorry, I just looked at the patent and diagram. I'm using a circuit that is almost the same as hers to test some coils I've been building lately. In mine I have the diode back across the coil from the transistor, instead of ground. And I have a capacitor at the top of the coil, which is insulated from the battery by a diode. The pulses become twice as wide on the load coil, since the collapse adds width. I read some of her theory on magnetic current, but she lost me when things got too complicated. She gets into all kinds of particles, and configurations, which to me is too complex. Nature tends to be simple, and so should the explanations of her laws. If you have to make physics too complex, you're lost. I just wanted to bump this thread up. Hopefully, Rosemary Ainslie will post more in her blog. Based on the circuits and work done in the Electric Motor Secrets thread, this circuit should be easy enough to understand. For those that do not understand it, I will describe its function in a later post. There are broad implications connected with the proper understanding of the functions of this circuit. We all owe Rosemary Ainslie a deep debt of gratitude, both for her discoveries, and for her willingness to publish her results for the betterment of Science and the human condition. Last edited by Peter Lindemann; 05-31-2009 at 05:21 PM. Good read, similarities with Leedskalnin in my opinion. Last edited by Raui; 06-01-2009 at 11:46 AM. Thanks for starting the other thread for the discussion of the Electric Heater Experiment by Rosemary. Just for clarity, we can continue to devote this thread to the discussion of Rosemary's Magnetic Field Model, which remains her main interest. The high COP of the Electric Heater Experiment was "predicted" by the Magnetic Field Model, and was produced in an attempt to gather evidence in support of the Model. Aaron and I are arranging for Rosemary Ainslie to join the forum, so anyone interested in her Magnetic Field Model can address questions to her here. Anyone interested in the experimental results of the Electric Heater Experiment, my variation on the circuit, replications or further developments, please use the other thread started for that purpose, linked above. I think that this could be better accepted if the colorimetric testing was a bit more refined. I read the paper dated 02 Feb 2009 and had a few questions at once. What is the Specific Heat and Heat Capacity of the various materials alone with why can't the probe be placed on the exterior of the resistor instead of the confined interior of the ceramic? I also did not see where it stated if the core was parallel or perpendicular with horizontal? I was successful with a bit of care in placing resistance in a water bath driven by an Exciter, I would think the community would be much more inclined to look at this if the test were a bit more conventional. I'm sure they may have seen something, but to get academia to look at it they need a bit clearer data on how the heat measurement is taking place. Actual it may indeed benefit them if they put the whole device in a calorimeter, might produce better numbers. Just happened across the thread and dropped in, hope its of value. I agree with you completely. Rosemary and her collaborator, Donovan, have taken this as far as they can, due to resource restraints. I believe a circuit like this should be tested in a full calorimeter set-up, as you suggest. 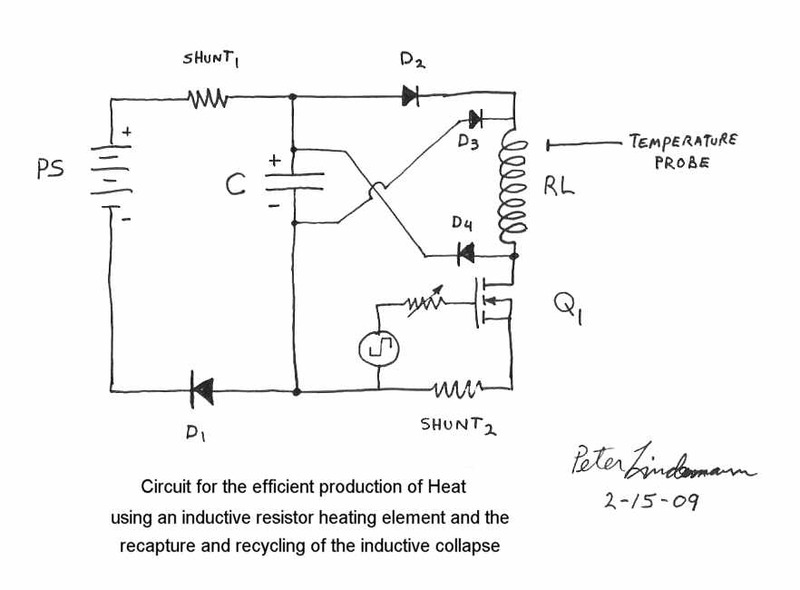 Its the only way to "know for sure" how much heat can be produced and how much of the electricity is actually "dissipated" by the operation of the circuit. I hope someone with both the time and the money can follow up on this. That is why we are publishing the material. Guys - I've just discovered this thread. Is this intended for a discussion of the field model? I'd love to engage - if there's any interest. I thought the only interest in this was it's physical application. But the model shows much more dynamic means of applying and generating energy - if anyone would care to wrap their minds around it? If not - I guess it's because the model is a little obscure. But I could, perhaps, try and make it clearer? I started this thread for specific discussion on your model and the other thread is for replicating the actual circuit that applies the concepts. great stuff. Thanks Aaron. I'm going to try and prepare something here. I'll post later this pm. I actually didn't realise that this thread existed. Having found it I believe I can indulge my interest in physics here and perhaps try and describe the model. If anyone reads this - here's my warning. I'm an amateur - but, I hope, more in the sense that I trained myself - than in that I have no training. But for those readers who are not themselves into physics - that could be a good thing. Because, coming in from the outside - I am obliged to work with really basic concepts - and I believe therefore that my observations have a simplicity that makes it readily accessible to the layman. If you're trained, I would urgently advise you to read no further. The chances are you'll be supremely irritated at the sheer presumption of my reach - the more so as there is very little that is mathematical and far too much that is conceptual. However, I do have a form of logic, albeit it idiosyncratic. However, having said that there is the chance that, at it's worst - it might entertain a purist to see the bazaar machinations of thought applied by an outsider to the complexity of the forces. I have found an amazing tolerance of these ideas on the Naked Scientist forums. I'm hoping for the same here. But tolerant or not, I would be delighted to answer any questions, should there be any - otherwise I'll just waffle on - in the hopes that this thread may gradually get a readership - or lose the little it already has. Either way - I at least have a record of those ideas and - perhaps, the day will come when the ideas will be more readily understood. Last edited by witsend; 07-18-2009 at 04:06 PM. The first thing that I need to point out is that science has served us well. Possibly too much so. We've made a deep reach into understanding nature, courtesy the extraordinary achievements of our giants in physics. And I'm anxious to acknowledge this. But for all that we may have progressed and indeed, continue to progress and at pace - we are also constrained to the limitations of nature and perceived reality. We may have mastered Nature's forces but we are still at her mercy. And our exploitation coupled with our sheer numbers and general excesses - are factors that are forcing us to strain against energy's defined limits. Else there is the real concern that the pollution from our excesses will uptip that fine balance in Nature and we will, as quickly, reverse the extraordinary achievements of our civilization and it's objects of freedom and plenty. That our excesses are causing these effects is not at question. And the results of these excesses looms large. We are constantly reminded of it through the media and - for some unfortunates - through the actual effects of Nature's harsh warnings. We have evidence in increasing incidents of floods, tornedos, melting ice caps, harsh winters, harsher summers, rising sea levels, depleting food reserves, and on and on. What is frightening is that we are also advised that unless something changes - then we may very well engender a new age of chaos where the fine structures of our societies will unravel in step with Nature's harsh lessons. These concerns have forced a new focus on energy. There is a need to find a plentiful source of this. It must be clean and green. It must satisfy requirements without any attendant pollution. And it must be quickly and easily manifest - to subvert the trends to chaos that are evident all around us. I sincerely believe that the search for free energy is gaining momentum in step with and as a result of this growing crisis. For now it's a fringe interest - precisely because it confounds a school of science that is predisposed to conservation laws and balance. To introduce the concept of free energy is to confront a history of belief that saw the world as a closed system where the checks and balance in the exchange of energy was predictably measured and measurable. To suggest that anything could emerge which was both abundant and limitless would disturb a mind set that has dominated centuries of science. But that is the nature of progress. The imagination must precede the fact and historically, our inventiveness has largely proved equal to the imagination. But to exceed the constraints of our conservation laws needs a profound revision of those laws. Again, I fondly believe that I have found where this energy lies and that it is, indeed in great supply. My hope, through these posts is to show you precisely where it is and, hopefully how it can be better accessed and - indeed, some of the potentials of this energy. But again, with the proviso that you'll tolerate the presumption and the poor facilities available to me to explain these insights. The first issue that possibly needs to be addressed is the fact that notwithstanding our exploitation of the forces neither classical nor quantum physicists have been able to explain energy, the thing itself. I think Newton was the trend setter. When asked what was gravity he replied 'I do not hypothesise'. The quote lacks appropriate reference but serves its point. Equations were developed that gave clear mathematical consequences and this new found precision gave the emergent science a foundation firmly established in accurate prediction. But this only advanced our exploitation of the forces rather than our understanding. The forces themselves remained elusive and mysterious. And, while this criterion to measure rather than postulate, established the foundations of science it also systematically appropriated to itself the right to use this science. I'm not qualified to address the history of this development. I simply want to point to the fact that the essential properties of the forces were explained only in application. The understanding of the thing itself remained and remains unexplained. And it was in an attempt to understand the thing itself that encouraged my own modest studies of this subject. I am pulling up closely to this topic and plan on doing some replication of the circuit posted. Thank you Witsend, Aaron and Peter for keeping true to convictions. I trust in this forum and I am not easily swayed by those whose purpose it is to simply dispute with traditional and incomplete proceedure. Admittedly i have much to learn on this topic. Guarenteed i'll do the experiment and try to contribute if at all possible. Can't wait for some time to get down to work! Hi Dude - thanks for the encouraging words. I agree. I get a comforting sight of new horizons. But it's all up hill at the moment. I wish someone who knew physics could take up some of these points of mine and run with it. In any event - so nice to see you're on board for tests. Love the picture. And stay on line. Who knows. Maybe we'll get an actual recording of a breakthrough from a replicated test. I think we need at least three such to start any real conversations with the public. the following 6 posts are simply copied from the Naked Scientists forum. Saves me the trouble of repeating the arguments. Farraday established that changing magnetic fields induce electric fields. And Maxwell balanced that by establishing that changing electric fields also induce magnetic fields. What has never been established is the electric field in a magnet on magnet interaction. This question has been addressed but never answered. I've presumed to suggest that there is no such electric field. The proposal is therefore based on the concept that a magnetic field may be a primary force and that the electromagnetic interaction may be a secondary phenomenon based on some interaction with this primary magnetic field. In effect, my model 'lives or dies' by this observation. So. If there is a KNOWN electric field in a magnet on magnet interaction - then I am wrong at get go. If anyone can prove a hidden electric field in a magnet on magnet interaction then the existence of that electric field will conclusively defy this entire field model. I am however, reasonably certain of this premise - having gone into it at some considerable depth and with acknowledged experts in the field. There has, apparently, been one experiment conducted. The results were inconclusive. Otherwise the question has been substantially mooted. There is, however consensus that there is an ASSUMPTION of an electric field within the material of the magnet. But this has yet to be proved. So. If that premise is taken as a possibility - no need to insist on it at this stage - then that is the first foundational concept of the magnetic field model. It is that a magnetic field is a primary force in the same way as gravity is seen as a primry force. The next point is to do with the nature of a magnetic field. I only refer to simple bar magnets because I could buy them and study them. But the nature of the field is evident in all magnetic fields. It appears to orbit, north to south and back to north. In other words it has a single justification or direction. It does not vary it's orbital direction but will move the entire body of the magnet to adjust to another field. However, in induced magnetic fields, such as in electric circuits, flux can change that orbital justification or direction but only with a corresponding change in the applied voltage or potential difference. In effect an orbit 'chases its tail' with a justified bias. And the orbit describes a circle. Also, as there is no change to the weight of a magnet as a result of this movement of flux then one may conclude that the actual quantity of that flux may be constant. In other words it orbits the body of a magnet - neither increasing or decreasing in quantity nor range of influence. I then developed what I refer to as a principle of correspondence - meaning that everything is substantially the sum of its parts. This applies to everything visible. A rock, for instance, comprises atoms and molecules that form that rock. If we ground the rock down to it's finest parts we'd find a collection of atoms and molecules that form that rock. In the same way I proposed that a magnetic flux field may also comprise particles being the smallest part of the whole field. And by using a principle of correspondence it may then be possible to determine the nature of that particle as it relates to the field. Becuase the magnet has two poles, then the particle would be a magnetic dipole. Because the amount of flux does not appear to vary - then the number of particles comprising the flux would be constant. Because magnets align north to south, then these dipoles would align north to south. In effect they would form strings. Because the field appears to be smooth then the particles would have to be arranged in some smooth pattern of charge distribution - evenly dispersed thoughout the field. In effect the actual shape of the flux is toroidal and the correspondence of the particles within those strings would be precisely aligned to balance that charge. The net result would be that that all parts of the field would have a perfectly balanced charge - the one part being entirely indistinguishable from the other. The reason I propose that the particle in a magnetic field is not visible is because of a principle that I described as a boundary constraint. In terms of this I drew an analogy to a machine that propels stones. Assume that the machine is in a vacuum - no extraneous forces, and that the machine always propels stones with a constant force. So. The smaller the stone the further the throw and vice versa. But if the stone is too small the machine can't detect it. And likewise, too big and the machine can't throw it. Those interactions of the stone with the field point to an inverse proportional relation to the distance and force at which stones can be thrown. And, those extreme limits are proposed as the machine's boundary constraints. In the same way I'm proposing that light can deflect off everything provided always that it's within light's boundary constraints. We know that light cannot detect particles in a magnetic field because we have never found a particle even with the use of light which is the fastest thing with which we can measure speed. If it exceeds light speed it may be because the particles in that field are too small to be detected. And - to satisfy the symmetries proposed by the concept of momentum as this relates to velocity and mass - it is also proposed that just perhaps, velocity and mass are inversely proportional. So. If light speed is a measure of a photon's energy - which it is, then if something is smaller than the mass of a photon it may, correspondingly have a greater velocity. And if such a magnetic particle is both smaller and faster than light itself, then it would be moving outside our measurable dimensions. In effect it would precede the timeframe of light itself. Light is, in effect the limit to our measurable dimensions. But having said that, it is clear that flux shares our own dimensions of space. It may, however, precede our time frame simply because it's velocity may exceed light speed. In effect our own three dimensions of space are shared with magnetic flux but the actual time frame of that flux may exceed our own. But all that's proposed at this stage is that the magnetic field may comprise a particle. If it does, then that particle may exceed light speed, may have less mass than a photon and may move in fields substantially structured by those strings. All of which is speculative and possibly irrelevant. However, my object is to try prove that relevance both as it relates to the particle and as it relates to the field. But to do so I first need to speculate on yet another possible condition. What if the entire universe comprises these magnetic fields as a backdrop to all that is manifest? Perhaps the vacuum of space in fact comprises millions upon trillions upon uncountable little particles that form highly structured magnetic fields? And these fields are entirely undetectable because their strings all join up through the vast distances of the universe and they all orbit - in lock step - with each other - carefully and continually adjusting their positions in space so that the one magnetic particle moves towards another to adjust the position of it's one dipole against that of it's neighbouring string's dipoles. The net charge at any one point in space would be zero. Yet these fields may indeed be extant - doing what magnetic fields do everywhere. They orbit. They appear to orbit at speed. And they adjust their positions one to another - perfectly. So here's the final 'what if'. What if, for whatever reason, one of those strings broke? Or if, through some singularity, a whole lot of strings broke? Then, in terms of the model, those little particles would do one of two things. Some would gain mass and lose velocity in proportion to the energy in that string. And others would gain velocity and lose mass, also in proportion to the energy in that string. And, by gaining mass - the proposal is then made that they become manifest in our measurable dimensions. That, as I see it, forms the basis of the virtual particles. Those particles that are manifest would then, possibly, slow down to the speed of light. And when that energy is expended they would again lose mass and regain velocity to slip back into the field. This was my proposal for the evident decay of virtual particles. I call the manifest particle a truant and the magnetic particle a zipon. I need to point to nebulae generally because it becomes a relatively easy mental reference in describing the difference between the particle and the field and its proposed manifest truants. Else the frame of reference tends to become confusing. And since it is also proposed that these nebulae are the source of all matter then it is also be apt as a primary reference. I propose that the magnetic fields that form the universe comprise really, really long strings of zipons that align, head to toe, so to speak. And I've proposed that all magnetic fields are toroidal. This toroidal shape is not exactly evident in a bar magnet because the path of the flux through the body of a bar magnet is both hidden and constricted to the shape of the magnet. However, if one follows the line of the orbit, then the south/north, so to speak, passage through the body of the magnet simply completes the journey of the flux back to the second phase of the flux cycle, north/south, outside the body of the magnet. In effect the flux is toroidal but the shape not so clearly evident in your average bar magnet. Therefore, as it is proposed that a magnetic flux field is toroidal then it is also proposed that the universe itself may be toroidal. The strings of zipons, in turn, join - in long lines throughout the entire universe. Which, in turn, makes for some really, really long strings. But the outer strings of that toroid would be longer than the inner strings. So there would be an intrinsic difference to the actual energy in each string. However, the shorter inner strings are supported by neighbouring strings which gives them a lateral strength, or force, or energy that would be equal to the longer outer strings. In effect, what I am trying to describe is that the proportion of balance and charge throughout the toroid would be precisely and evenly distributed in each of its parts - each part being precisely the same as every other part. In effect no part of the field could be distinguishable from another. No variation. A smooth structured balanced field with all parts moving in precise synchonicity with the next, shoulder to shoulder and head to toe. In the event that one of those string broke loose, for whatever reason then the proposal is that the zipons in the string would lose their velocity determined by their orbit in the field, or they would increase their velocity. Both possibilities are probable, and in either event they would lose their structure as a string and collapse into a field of dissassociated particles, half of which would be manifest as truants. This is proposed as the advent of nebulae that appear in space. Just broken strings that have collapsed together as a result of a break in the earlier and orderly distribution of the zipons in the field and the string itself.